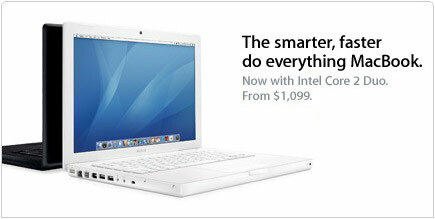 It was not too long ago that Apple updated the MacBook Pros with Intel Core 2 Duo processors. Today they have done the same with the regular MacBooks. Each MacBook now sports a Core 2 Duo processor, either at 1.83 or 2.0 GHz. The Core 2 Duo processor upgrade makes the MacBooks up to 25% faster than their Core Duo MacBook predecessors. As with all 2.0GHz and higher Core 2 Duo processors, they feature a 4MB shared L2 cache (1.83GHz Core 2 Duo model only has 2MB shared L2 cache). The 2.0GHz models also receive 1GB of DDR2-667 SDRAM as standard and a 6x SuperDrive with double-layer support. Other than that, the MacBooks have stayed relatively the same.